Defensive coaches spoke Saturday afternoon once practice wrapped up. Reports were largely positive, centered around the progress made so far. The defense got the better of the offense on Thursday as offensive assistants talked about throwing an entire install at their groups. Heads were spinning on offense; bodies were flying on defense, though. Chinander said he expects that to change as the offense gets more comfortable, but for right now he’s pleased with the energy and effort of the defense through the first full week. Earlier in the week, the secondary snagged a couple interceptions in practice and let everyone know about it. And that’s where the biggest challenge facing this new defense lays during the spring. They’re not learning a completely new scheme like the offense, they’re building a completely new mindset. That’s a stark departure from last season. Aggressiveness was sacrificed in the name of mitigating chunk plays and points and in the end, none of it worked. In the conference, Nebraska ranked: last in sacks (14 total), last in tackles for loss (44 total), last in turnovers forced (12 total), second-to-last in 10-plus-yard gains allowed (187), and finally second-to-last in scoring defense (36.4 per). Receivers were afforded a first down’s worth of cushion and players were sometimes frozen trying to process what to do. The goal of Chinander’s spring is changing that. “I think it’s an easy process to get them to start thinking that way, now doing it on the field is a different thing,” he said. “Really letting it loose, not being afraid to make a mistake — like Coach Frost talks about, the desire to excel and no fear of failure — let’s go make a play and if you miss, you’re not going to get MF’d, you’re not going to get dog-cussed, we’re going to teach you how to do it better. If there’s one person that most personifies that culture change taking place for the Blackshirts it’s cornerback Lamar Jackson. The former four-star entered with loads of promise and has since underwhelmed. Jackson talked Thursday about his goals of improving as a tackler; Chinander said that’s the key to unlocking him. “I don’t think the defense matters, that kid should thrive in any defense,” Chinander said. “He’s got talent. He needs a little bit more physicality and we need to work on that. He knows it and he wants to work on that. >> On the secondary as a larger group, Chinander said they’re “making that transition nicely” from what they were coached to do last year to what this new staff wants them to do. 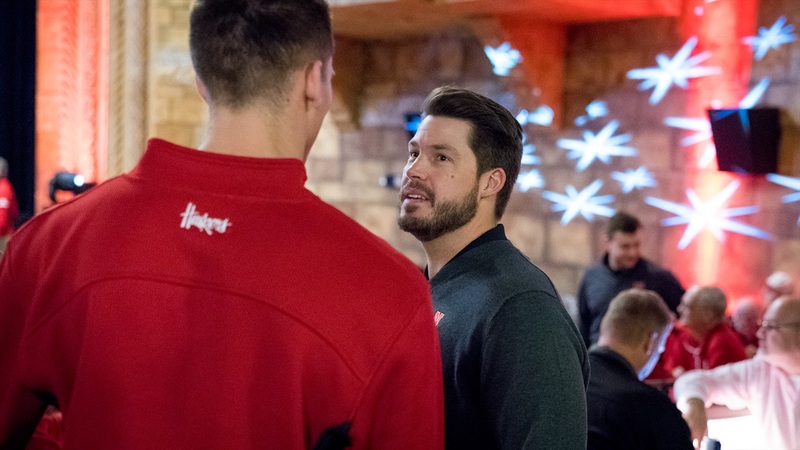 The first step in that transition was gaining the players’ trust before any kind of coaching started, and Chinander said things have gone well in that department. >> At nose tackle, Chinander has been pleased. “We’ve got a few guys that are rotating in, Coach Dawson’s kind of playing everybody at every position so we can get a good evaluation on who should be where. Also, if the right end goes down and the left end is the next best player, he can jump in there instead of having to put the sixth best guy in. >> Linebacker might be the deepest group on the defense, if not the entire team. Chinander had good things to say specifically about junior Mohamed Barry, junior college transfer Will Honas and senior Dedrick Young II. On Honas, Chinander said he’s “swimming in deep water a little bit being brand new to Division I football, Big Ten football, but he’s done a nice a job.” Honas definitely looks the part of a Big Ten linebacker. >> Part of the “defense won the day” narrative out of Thursday’s practice was fueled by some general inefficiency on the part of the offense that comes with learning on the fly and making mistakes. Chinander said that given the tempo of the offense and the aggressiveness of the defense, it’ll happen.